This tutorial aims to show you how to activate a new iPhone and how to active an iPhone after flashing it. 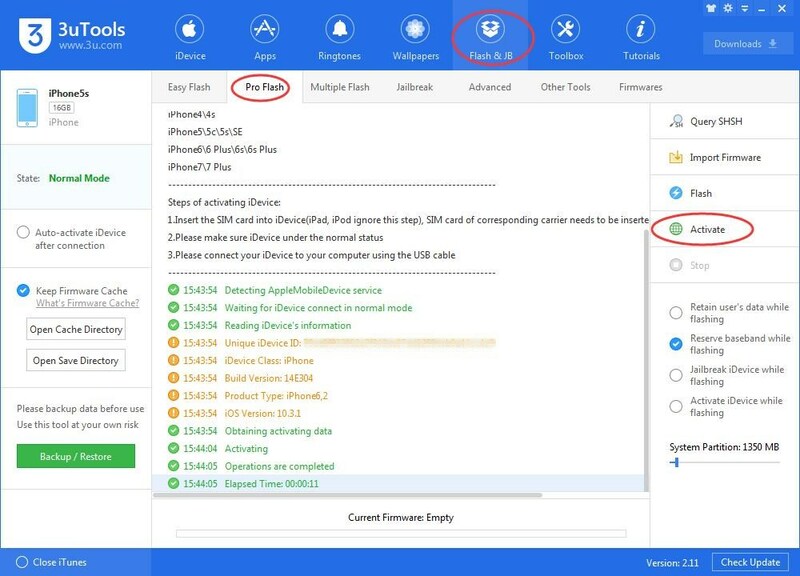 Two methods are introduced: activate iPhone manually or activate iPhone via 3uTools. Setting up a new iPhone is generally very easy, this method is used to activate a new iPhone. Please make sure that the SIM card is in your iPhone. Press the Power button in the top right corner or on the right edge, depending on your model. Till the screen lights up and you’ll see the image below.Swipe the slider to the right to begin iPhone activation. Select the language you want to use. Then select the country you want to use the phone in and click Next to continue. You need to connect iPhone to a Wi-Fi network. Once you've connected to Wi-Fi, your iPhone will attempt to activate itself and it may take few minute to activate your iPhone. Now, decide whether you want to turn on Location Services or not. Some people may not want to turn this on, make your own decision and then can move on to the next step. Touch ID is the fingerprint scanner built into those devices' Home button that allows you to unlock the phone, use Apple Pay, and buy at the iTunes and App Stores with just your fingerprint. If you want to use Touch ID, place your thumb on your iPhone's Home button and follow the onscreen instructions. You can also choose Set Up Touch ID Later. The final security option is to create a passcode. Four different options for you to choose. Make your own choice and continue to the next step. In this part, please select the option Set Up as New iPhone. And the you’ll go to Apple ID page again, if you don’t have an Apple ID or forget it, you may set up later in settings. Just click “Agree” -> Don’t Use Siri-> Don’t Share iPhone Analytics and then you’ll come to the welcome page. Click Get Started. You've completed the iPhone set up process, you can start using your iPhone now. After you flash your iPhone, wait until iPhone is turned on. Keep iPhone connected, click Pro Falsh → Activate. How to Download Apps Using 3uTools? How to Unlock iPhone? How to Erase iDevice’s Data Remotely? How to Enter KDFU Mode While downgrading? How to Download Apps Without Apple ID & Password? What to Do If You Can't Activate Your iPhone? FAQ for Downgrading to iOS 6.1.3 / 8.4.1 with 3uTools What’s Recently Deleted?